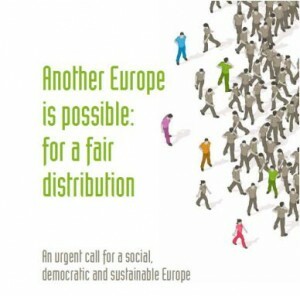 The Alliances to fight Poverty presents his memorandum for the next European elections. It is more than a memorandum. It is an awakening Call and a Call that wants to unite -like the Alliances- every organisation and everyone around the fight to poverty, social exclusion and inequality. It formulates our main vision on Europe, a renewed Europe, a social, democratic and sustainable Europe. The ‘Alliances to fight poverty’ put forward three essential objectives for a renewed Europe. The prime concern of a renewed Europe should be the well-being of everyone. We understand well-being as the freedom to choose and lead lives we value and have reason to value. This freedom depends on a better implementation of human rights and on an enhanced democracy. Therefore we need to restore the concept of global solidarity both between and within member states. A renewed Europe has to reconnect its economic priorities with the social, ecological and climatic challenges we face. Therefore Europe hasto invest in the rich economic diversity of our countries and regions. It should bring them into constructive or rich competition with each other in order to stimulate an equal standard of living. Besides, by stimulating rich competitiveness we challenge the world to seek its own social and ecological protection systems. Accordingly, the EU can lead a global development that is based on ensuring well-being and sustainability. A new project for Europe has to answer the democratic challenges created by the European construction. To answer these we need to return to the basic elements of this framework. Cooperation between all levels and between all ‘living forces’ is an essential part of the answer. A rich definition of subsidiarity forms the basis of an answer that combines solidarity and democracy. The cornerstone of this new project is an enhanced social and civil dialogue at European and national level. This renewed Europe necessitates a fair distribution of power, resources and means. Our goal as the ‘Alliances to fight poverty’ is to gather NGOs, social partners and civil society along with cities, regions, member states and the European institutions around a new vision of Europe wherein fair distribution occupies centre stage.